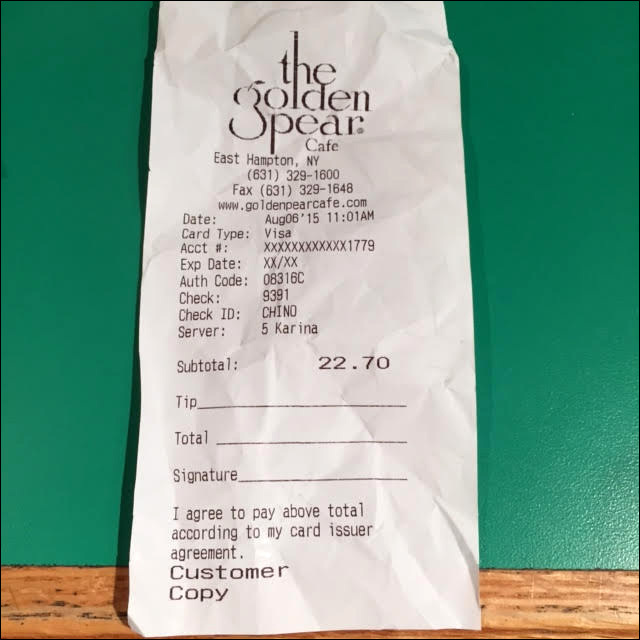 This is brought to our attention by a reader named Warren, who became the latest recipient of the racial receipt during a recent visit with friends to The Golden Pear Cafe in East Hampton, New York. 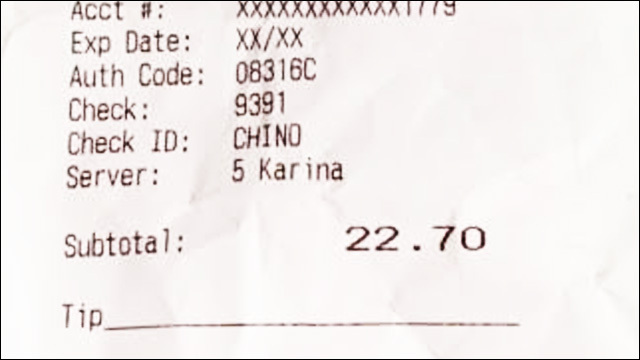 Upon ordering his food -- a breakfast burrito and a smoothie -- and taking a seat, he was shocked and disheartened to learn that on his receipt, in the space designated for the customer's name, the cashier, Karina, had identified Warren simply as "CHINO." And yes, Warren is Asian, which Karina clearly made note of. I brought the receipt to Christina, the manager of the location, and she handled the situation poorly. She confiscated my copy of the receipt (though not before I took a picture of it) and tried to defend Karina instead of offering a genuine apology. Christina had Karina speak with me to make amends, but Karina instead tried to defend herself as well. Neither Christina nor Karina believed Karina had done anything wrong, and that was a huge cause of concern for me. Karina and Christina both said they write racial descriptions on receipts to describe customers "all the time." The employees at Golden Pear Cafe clearly do not know how to interact with people from different backgrounds and feel empowered to demean and discriminate against Asian American clientele. Yes, I'm aware that "Chino" in Spanish is often used as a broad term for Asians. In this instance, I doubt it was intended maliciously. But still, does that make it appropriate? How hard is it to ask for someone's name? Or maybe just take a quick glance at their credit card? Is this most egregious offense in the world? Is it as bad as "lady chink eyes"? Of course not. But whether the cashier had labeled Warren as "chinx" or "Ching Chong Lee" or "Asian Guy," it's just another everyday interaction to remind us that, sometimes, with this Asian face, we're not even a name.